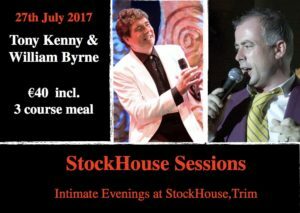 StockHouse Sessions, an intimate evening of quality food and amazing music, present the legendary Tony Kenny and William Byrne on Thursday July 27th 2017. Tickets €40 which includes a 3 course meal. This is a night not to be missed as these two music greats collaborate to present a night of entertainment in StockHouse, Trim.